Our Jail Diversion Program provides mental health screenings and advocacy for individuals recently arrested and in jail who have mental health treatment needs. Our Justice Involved Program provides case management services to individuals currently or previously involved in the justice system by providing tools and skills needed to succeed in their community. 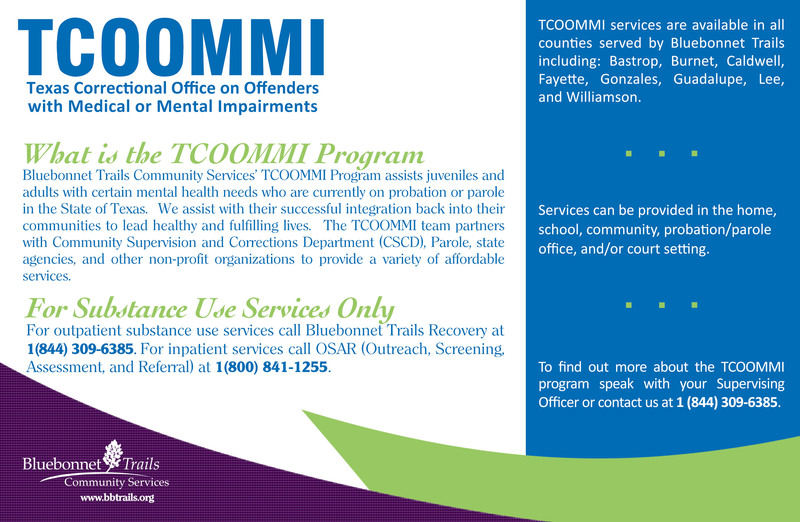 Our Texas Correctional Office on Offenders with Medical or Mental Impairments, TCOOMMI Program, works closely with the criminal justice system to provide the highest level of forensic case management for individuals who are involved in the legal system. 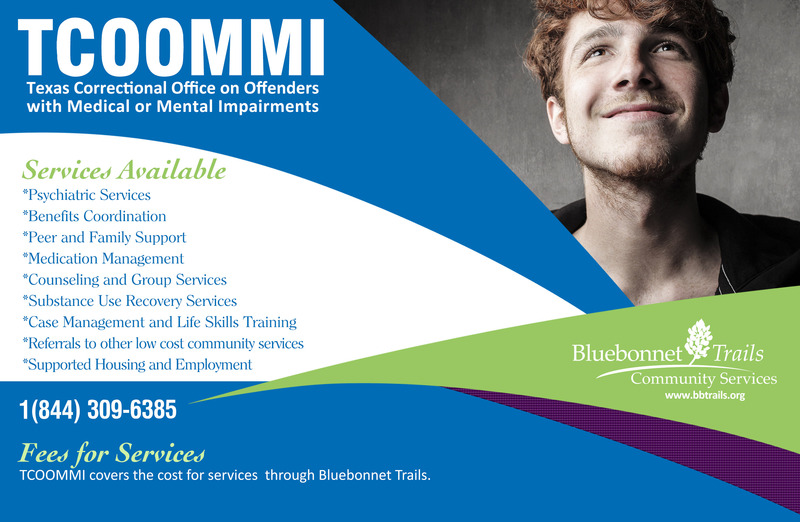 Services: Bluebonnet Trails Jail Diversion Program staff work with local county jails to identify people with mental health treatment needs and divert them into behavioral healthcare services including psychiatric hospitalization and outpatient treatment. Jail Diversion has staff located inside Austin State Hospital and work closely with other state hospitals to expedite admission. Bluebonnet Trails’ Justice Involved Case Management Program partners with mental health task force members, sheriff’s departments, probation departments, court officials and community members to work towards the reduction of individuals entering the criminal justice system or placement into a psychiatric hospital. Services: Justice Involved Case Mangers (JI CMs) provide skills training and case management services focused on criminogenic risk factors and behavioral health treatment needs. JI CMs make referrals to community support services and substance use treatment services when appropriate.